Piracy and discoverability are the top issues facing app developers today, according to new research conducted by the organizers of GDC Next sister event the App Developers Conference. In order to paint a picture of the app development landscape as it stands right before ADC, more than 250 app creators were surveyed on topics ranging from targeted platforms and app stores to app verticals, monetization methods and more. The full text of the survey results is available for free. Organized by UBM Tech (also owners of Gamasutra), creators and producers of the largest and longest-running professionals-only game industry conference, the Game Developers Conference, ADC will take place November 5th-7th at the Los Angeles Convention Center and will be co-located with another inaugural event, the future-facing GDC Next. The ADC survey found that piracy is a major issue with app development—though it appears that some developers feel the sting far more heavily than others. 26% of surveyed developers reported that to their knowledge, their apps had been pirated. Of those developers whose apps use in-app purchases (IAP), a similar 26% found that their IAPs had been hacked (that is, obtained without payment). In a free-form survey question, developers were asked to identify what they felt to be the biggest problem within the current app development market. Most answers connected to problems with discoverability—albeit from different ends of the spectrum. Developers frequently described app stores as “crowded” and “overpopulated with low-quality apps”; others also noted that users’ expectations for free apps made it hard to charge even $0.99 for their higher-quality app. Other developers cited platform and device fragmentation as their main issue: “Too many devices and operating systems to support,” “Too many app stores,” “Too many competing platforms,” “Different languages and stores,” and other similar comments came up very frequently. When it came to how their studio attempted to solve said problems, most developers were fairly clear: Make better apps. “Create the best app possible,” “Build a quality app,” “Make innovative apps,” “Give them an app worth paying for,” “Make things that matter,” and similar responses were very common. Games were by far the most popular app category: 69% of surveyed devs made games, followed by entertainment (37%), education (32%), lifestyle (22%), brand marketing (21%), enterprise (16%) and health/wellness (14%). 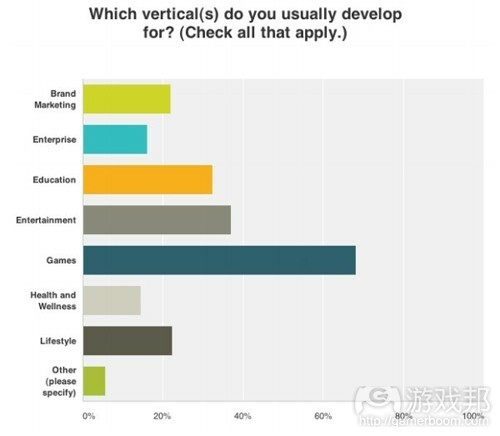 But the respondents didn’t only make games; a significant portion of game dev respondents also made apps for general entertainment (38%), education (29%), brand marketing (17%), lifestyle (15%), health and wellness (11%), and even enterprise (11%). ADC is an entirely new event from the creators of the acclaimed Game Developers Conference focusing on the very best programming, architecture, UI, marketing and business of apps outside of games. Speakers include notables from Evernote, Dropbox, Netflix, Pandora, Six To Start, Tumblr and a multitude of others. The show is co-located with Game Developers Conference Next – an in-depth event that will feature detailed content about creating the game experiences of the future, from free-to-play through indie and next-gen platforms.